We are a family owned business. 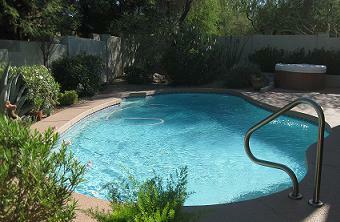 Since 1999, we have specialized in residential and commercial swimming pool needs throughout the Phoenix area. Our technicians are on time and in uniform every week so you never wonder who is in your backyard. Please see our menu of services on the Monthly and Weekly Service Rates page. Want to speak with a swimming pool cleaning and maintenance specialist? We are proud of our Credentials! We work hard to stay on top of the latest technology and developments in the swimming pool industry. We were proud member's for over 17 years of I.P.S.S.A. which stands for Independent Pool and Spa Servicemen's Association. Through our affiliation with I.P.S.S.A. and with our relationship's we formed, we are in direct contact with all the vendors of every type of pool equipment on a monthly basis. Our education never stops and we enjoy growing with the ever changing technology of the swimming pool industry. We also carry liability insurance coverage and have the man power so that if our service technicians get injured or sick, your pool will continue to be serviced by top professionals within our company until our technician has recovered. We are also certified heater technicians, water chemistry certified and are C.P.O. certified. We hold the highest rating of A+ at the Better Business Bureau so you know you are with a company you can trust! Our certified pool operator certification is renewed every five years. It includes but is not limited to water chemistry and the Langlier Index, hydraulics, proper sanitation techniques, alkalinity and pH of pool water, emergency procedures, closing and re-opening of pools and much more. Any pool service technician servicing a commercial pool must be C.P.O. certified. If you want expert service at an affordable price – whether you are in Phoenix, Cave Creek, Carefree, Scottsdale, Glendale, Peoria, Mesa, Chandler, Gilbert, Tempe, or any of the nearby cities - it's time you experienced the professionalism, integrity and ethics of Dan's Pool Catering. 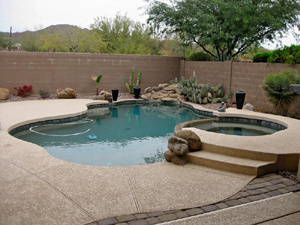 For over 15 years, we have been the swimming pool company of choice for residential and commercial pool owners throughout Phoenix and the surrounding areas. When you see our uniformed swimming pool technicians working on your pool, you can be assured that you are getting the very best service available. Professionally, We are certified in water chemistry as well as pool heaters. We also hold the status of Certified Pool Operator. These professional designations mean that your pool is in very capable hands. We are also certified by APS power company to install and calibrate the energy saving variable speed pumps which became law in January, 2012. Maintaining your pool properly is one of our primary objectives. There is a science to this, so there is no room for guesswork. Obviously, you want your pool to be clean, and free from any algae growth. You certainly don’t want to have any unpleasant odors around your pool. A clean, fresh pool is not only possible; we guarantee it. We achieve this by making sure the pH balance is correct and stable. We also check the alkalinity of the water; if that is not at the right level, the water can become cloudy. You want your water to look like a pool, not a lake! We service Shasta pool's, Paddock Pool's, California Pool's and every other builder in the valley's pool's. We have serviced thousands of pool's in the valley and are rarely surprised by any pool or equipment. We do it all from weekly service, to repair's of equipment, plumbing and new equipment installations. We are partnered with all the leading manufacturers of pool equipment and the latest technology. Regular weekly pool service is critical to making sure your pool is clean and clear all year-round. We offer different levels of regular service, depending on your budget and what you need. These services range from a simple weekly chemical adjustment all the way up to a complete system remodel . Check our Monthly and Weekly Service Rates page for the price schedule, but consider this: our most complete and thorough service comes to less than $4 per day. Isn’t it worth $4 to know that your pool is being maintained and cleaned properly, and is always in perfect condition to jump in for a swim? Let us take care of that for you so all you have to worry about is enjoying it. It’s a fact that cannot be avoided: like everything else, pools get dirty. A swimming pool can accumulate dirt in places that can be readily seen, and in other places where it would go unnoticed. It’s our job to notice it! Nothing makes a pool look less inviting than leaves or other debris floating on the surface. The walls and floor of the pool can also build up a level of dirt and debris that needs to be removed on a regular basis. 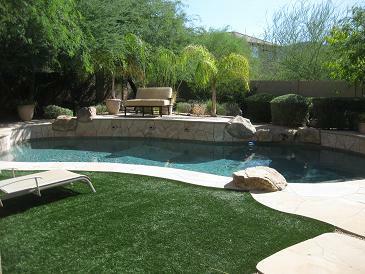 We can take care of that, in addition to brushing the walls of the pool to prevent algae from ever beginning to grow. In addition to these, your pools pumps and filters also need a regular cleaning in order to remain in good working order. We handle all of these jobs in Phoenix, Cave Creek, Carefree, Scottsdale, Glendale, Peoria, Mesa, Chandler, Gilbert, Tempe or any of the nearby cities. If you notice a problem area, such as a crack in the plaster or a leak somewhere in your swimming pool or equipment area, it needs to be taken care of as soon as possible. A small problem never gets smaller; it only gets bigger. And bigger problems are usually more expensive. When we do our regularly scheduled cleaning and maintenance, we always watch out for any needed repairs so that they can be taken care of quickly and efficiently. We really love taking care of swimming pools, and we are honored that you are considering our service to help maintain your pool. Give us a call to arrange an initial visit and work out a regular schedule. Please see our Monthly and Weekly Service Rates page for pricing examples. 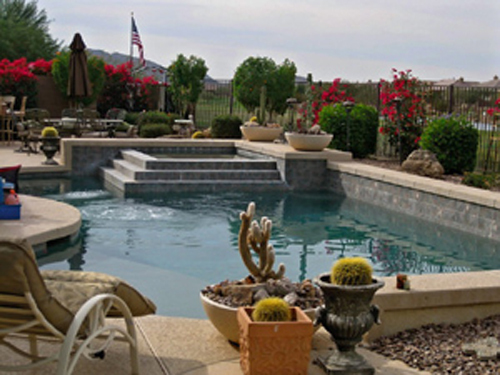 We provide swimming pool maintenance and pool service in Phoenix, Arizona as well as Cave Creek, Carefree, Scottsdale, Glendale, Peoria, Mesa, Chandler, Gilbert or any of the nearby cities.